NEW YORK: Today at Climate Week NYC, The Climate Group held LED streetlighting day, marked with the launch of a new series of reports and a bold call to action for every city to adopt LEDs because the technology is "the lowest of the low hanging fruit" for local governments' low carbon transition, according to CEO Mark Kenber. 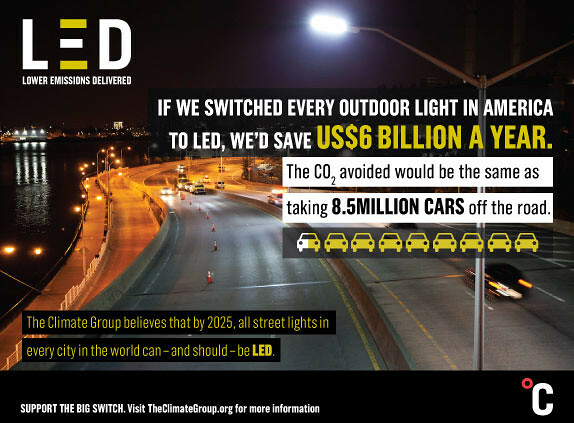 This morning The Climate Group announced the launch of a major campaign, LED = Lower Emissions Delivered, to encourage local governments, cities and utilities to embrace the carbon and cost benefits of switching to LED streetlighting, and called for global adoption by 2025. Cities around the world already want to make this transition to LED streetlighting according to our new report, The Big Switch: Why it's time to scale up LED street lighting, the first in a new series called The Big Switch. It states that while the technological barriers for switching to LEDs have been overcome, cities want more support from government and financial institutions to refine business models and financing options to help make the switch. The findings are the result of a two-year consultation by The Climate Group with cities, following our global LED street-lighting trials in 12 major cities including New York, London, Kolkata and Sydney. The consultations were conducted in cooperation with Philips Lighting. Trials covered in the report show cities that have adopted LED streetlighting achieve energy savings of between 50-70%, with even more energy saved when combined with LED smart controls. In New York, the city is replacing 250,000 street lights with LED, the largest project of its kind in the US. By 2017, the city will be saving US$14 million in energy and maintenance costs. India also recently announced it will switch all of its 35 million street lights to LED, with expected savings to exceed US$850 million. If all global indoor and outdoor lighting was converted to LED, this would reduce global electricity consumption for lighting by more than 52% and avoid 735 million tons of CO2 each year. The emissions savings would be equivalent to the emissions of California, Pennsylvania and New York combined. Support our call for wide-scale LED streetlighting by sharing the facts on social media. Click below to download our graphics. Today at Climate Week NYC, The Climate Group is also organizing two expert roundtables on LED streetlighting on finance and utilities, with a focus on the challenges of adoption for US cities and utilities. We will explore mutually beneficial routes to providing enhanced street lighting solutions and LED-based lighting tariffs, urging participants to publish their intentions by the end of 2016. Outcomes of the roundtables and future events will be shared and used to further scale up the city switch to LED street lighting. But our campaign to accelerate LED adoption goes beyond the walls of our events. Throughout Climate Week NYC, acting as a visible call to action for cities around the globe, the iconic Times Square Ball, lit by 32,256 Philips Luxeon LEDs, has been programmed to display ongoing variations of the color green interspersed with images of a spinning planet earth. See it here. “As an emissions-cutting and money-saving technology, LED street lighting is the big no-brainer. There is no longer any reason why the big switch shouldn’t start today, accelerating adoption in the US and around the world," urges Mark Kenber, CEO, The Climate Group.